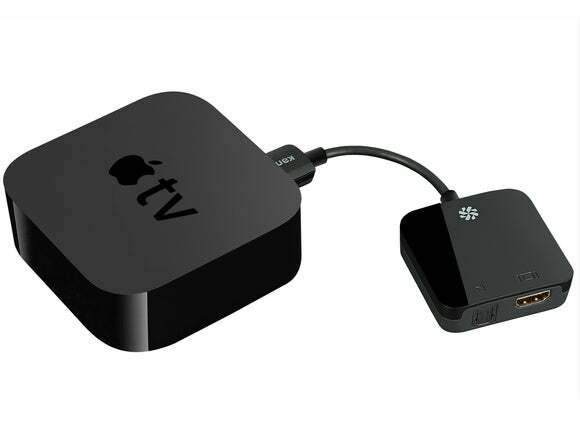 When the fourth-generation Apple TV came out, the complaint I expected least was the lack of an audio output port. That’s because I own a relatively new receiver that handled HDMI audio and video switching; while not rare, it’s nowhere near common. 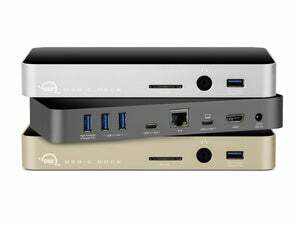 Many people rely on older receivers that can’t switch HDMI and extract the audio, use stand-alone powered speakers that require a separate audio signal, or prefer receivers that omit digital video functions. 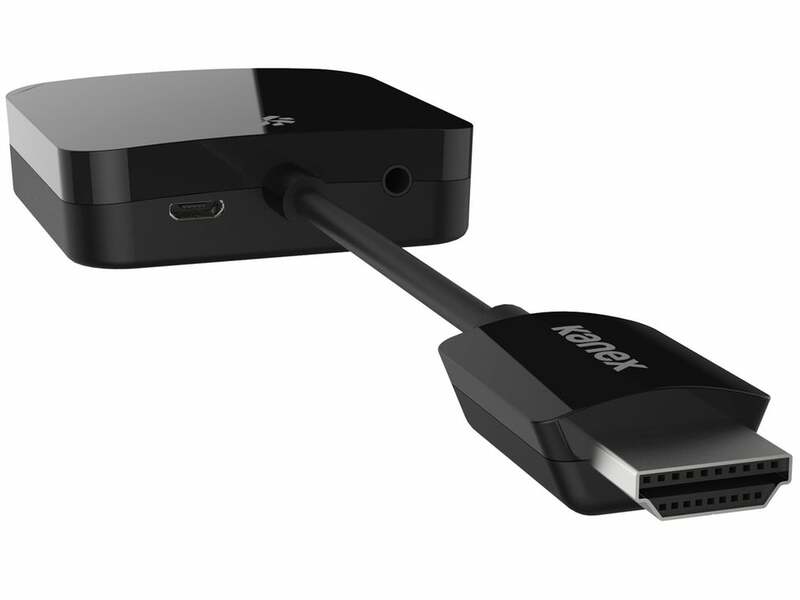 Kanex has a solution for everyone who fits that description, the Digital Audio Adapter for Apple TV. The only downside is its $60 price tag—although far cheaper than getting an HDMI-switching receiver. The Kanex (at left) is compact, sleek, and well designed, but it’s got lots of jacks and plugs to manage. 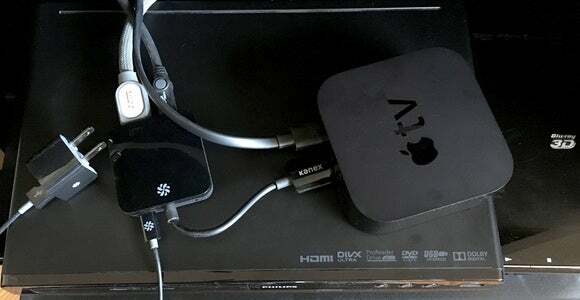 The Kanex adapter is, in essence, an HDMI shunt: It has a short integral HDMI cable to plug into an Apple TV (or a Roku, Amazon Fire TV, or other devices), and an HDMI port to accept a cable that connects to a TV set. You can plug it inline with an existing setup. 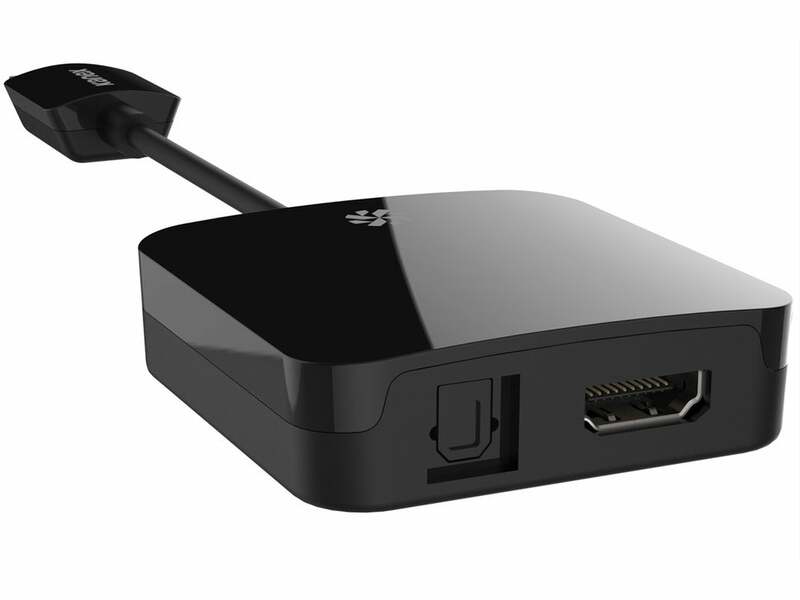 It supports HDMI 1.4 and ostensibly passes through every high-definition format and resolution currently available. 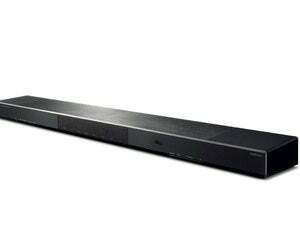 It has both S/PDIF optical digital and 3.5mm stereo audio ports, which make it universally compatible. The drawback is that it requires power, although it includes a necessary micro-USB cable and compact AC adapter that has the same size and shape as one for an iPhone. You wind up moving around a fair amount of gear to get it hooked in, but that’s a one-time issue. In my case, I needed to feed the power cord out the back of my A/V cabinet, then slightly disassemble the receiver set-up to route the TOSlink optical digital cable into the S/PDIF. The S/PDIF support includes both 5.1 and 7.1 surround sound; Kanex says any uncompressed, encoded format will work, like DTS Digital and Dolby Digital. I tested this with an iTunes-purchased movie and a fourth-generation Apple TV, dutifully listening closely to each of my five speakers and subwoofers, and heard crisply delineated separation. Also note that the Kanex can only have one type of audio jack connected at once. That shouldn’t be a problem for most people. But if you swap among sources, be sure to unplug it from its power cable, remove one audio and replace the other, then plug the power adapter back in. With two plugs jacked in, Kanex says you’ll encounter problems. Kanex notes, I suppose for completeness, that its adapter doesn’t block AirPlay mirroring to the Apple TV. It’s really a straight HDMI passthrough, so it shouldn’t, but I expect some buyers want additional reassurance. The $60 price tag is the only thing that’s going to be a sticking point for some. You can get splitters with some part or all of the functionality for a third to half as much. But those come from no-brand-name companies, have few online reviews, and typically have an industrial look to them compared to the sleek shiny black finish of the Kanex model. These off-brand items also occupy about four to six times the volume of the Kanex, which is quite compact. 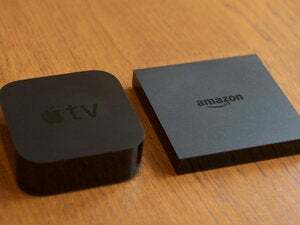 Kanex’s Digital Audio Adapter for Apple TV is elegant and comes with the backing of its reputation for managing technical support and manufacturing problems. For a plug-and-forget it device you want to work reliably, the extra price likely doesn’t work out to extra in the long term. Handy adapter that passes through video over HDMI from an Apple TV while splitting out audio in both stereo and surround-sound formats.